Internet Solutions Nigeria Review 2019: Is Internet Solutions Nigeria a Good Hosting? Internet Solutions Nigeria (ISN) is a well-established company that has been in business since 1997. It offers a simple selection of hosting services with good customer service provision. Internet Solutions Nigeria (ISN) has been in business since 1997. As well as hosting services, it provides internet services and I.T. consultancy to customers in Nigeria and West Africa. ISN’s engineers are based at their Lagos headquarters, but the company also has offices in Port Harcourt, Ibadan, Abuja, and Accra (Ghana). The ISN website is in English. It’s notable that ISN owns and operates its own Tier III data center, which means less than 1.6 hours of downtime per year. As well as providing a 99.999% uptime service level agreement, ISN also guarantees 99.982% availability thanks to its use of dual-powered equipment, multiple uplinks, advanced cooling, guaranteed power redundancy, and 24/7/365 on-site technicians. Hosting plans are simple and geared towards beginners. For example, all hosting plans are compatible with WordPress, Drupal, and Joomla. While ISN is responsible for DNS, firewalls, load balancers, storage, databases, servers, and the network (to ensure your website is always up-and-running), customers are responsible for the code, scripts, applications, data, and website security. As well as unlimited disk space, the hosting plans are fully scalable due to being load-balanced on multiple servers, so you’ll be fine with ISN even if your website is prone to traffic spikes. It’s reassuring to see that backups are well catered for by the company since ISN stores thirty versions of each of your files in a secure location, which you can access or download at any time from anywhere. It is surprisingly rare for a hosting company to provide such access to your backup files at no extra cost. ISN also offers standard hosting services such as domain name registration, SSL certificates, SiteLock security, and custom email addresses. 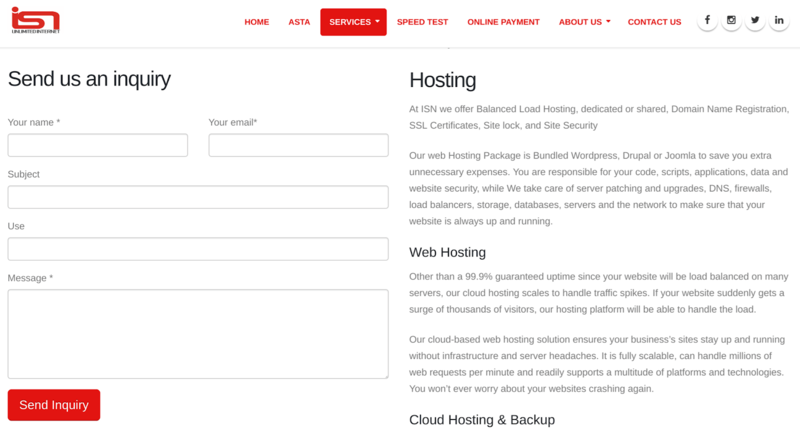 So, whilst ISN’s website looks pretty basic, rest assured that the company does offer all the usual hosting services. That is, apart from the one-click installer, website building tool, and support for advanced coding languages that you would expect from many other hosting companies. Unusually for a shared hosting company, ISN does not advertise its prices or let you sign up online, so you have to email the company to request further information. However, their website has a payment section, which suggests you can pay for ongoing hosting once you become a customer. I contacted the customer support team by email and Facebook to find out a price, and, unfortunately, I did not receive a reply. It’s certainly a frustrating sign-up process for me as a U.K. customer, but this may well be normal in Nigeria for all I know. ISN offers customer service assistance from 9.00am to 5.00pm on Mondays through Fridays, and from 9.00am to 2.00pm on Saturdays, whilst technical support is 24/7/365. As well as having several different telephone numbers and email addresses to contact different departments, there are also different sets of contact details for the different branches located in Lagos, Abuja, Port Harcourt, and Kano. This provider also has several social media profiles that are kept up-to-date. Whilst ISN might not have the features for everyone, this could be a good choice for you if you need a Nigerian host with a Tier III data center and excellent uptime. Wondering how Internet Solutions Nigeria stacks up against other Web Hosting companies? Enter any other Web Hosting company and we will give you a side-by-side comparison.